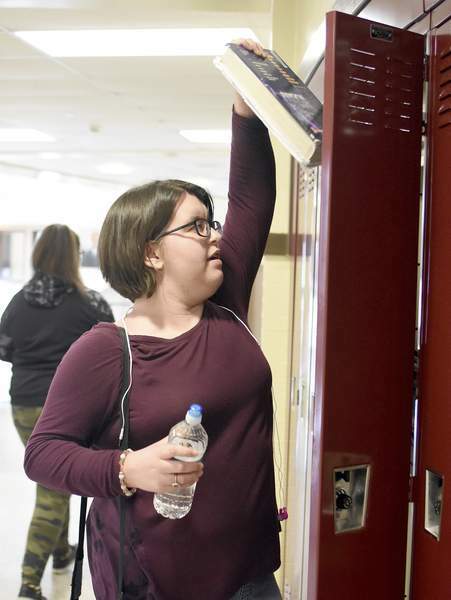 Photos by Rachel Von | The Journal Gazette North Side sophomore Devan Frayer grabs her things out of her locker for her next class last month. Frayer was born with hydrocephalus, or excessive accumulation of fluid in the brain. Doctors didn't expect her to ever walk or talk, but she's on track to graduate in 2020. 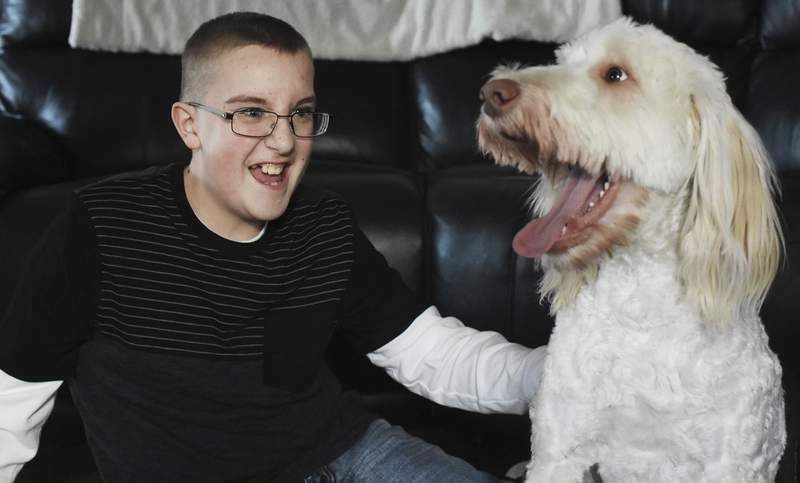 North Side student Ethan Elzey, 15, gets a smooch from his labradoodle Nellie. Elzey is moderately autistic and has a cognitive disability but has become active in athletics. Rachel Von | The Journal Gazette Portrait of Ethan Elzey at his home in Fort Wayne, IN on March 7, 2018. Ethan is moderately autistic and has a cognitive disability. Rachel Von | The Journal Gazette The Elzey family from left: Amy, Elizabeth, 11, Ethan, 15, Evan, 7, and Eric talk with son Ethan about his day at their home in Fort Wayne, IN on March 7, 2018. Ethan is moderately autistic and has a cognitive disability. Rachel Von | The Journal Gazette Devan Frayer receives accommodations to help her out at North Side High School. 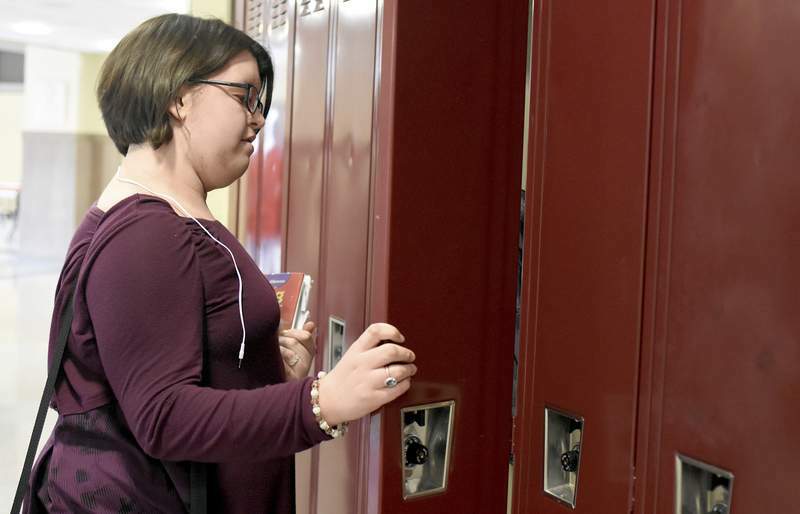 Rachel Von | The Journal Gazette Special Ed Series: Devan Frayer, sophomore, grabs her things for her next class at North Side High School on Wednesday March 21, 2018. She was born with hydrocephaly, which basically means some fluid in her brain can't drain like it should. It affects her motor skills and memory. Rachel Von | The Journal Gazette Special Ed Series: Portrait of Devan Frayer, sophomore at North Side High School on Wednesday March 21, 2018. She was born with hydrocephaly, which basically means some fluid in her brain can't drain like it should. It affects her motor skills and memory. Rachel Von | The Journal Gazette Ethan Elzey plays with his dog Nellie at his home in Fort Wayne, IN on March 7, 2018. Ethan is moderately autistic and has a cognitive disability. More than 168,000 students statewide make up the special education population, but don't try to pick them out of a crowd. They walk the same hallways as non-special education students and sit alongside the general student body in class. “Half the time you don't even know” who is identified as a special education student, said Lindsay Wolf, special education department chairperson at Homestead High School. Unified by a label, the students are anything but uniform. Their disabilities span 13 broad categories, including autism spectrum disorder, cognitive disability and language or speech impairment. In some ways, 15-year-old Ethan Elzey is like any North Side High School student. The sociable teen rides the school bus, plays sports and recently attended his first dance, a semi-formal. Unlike most peers, however, Elzey will never be completely independent, said his parents, Amy and Eric Elzey. He has a moderate form of autism and a cognitive disability. Lessons don't always stick with Elzey, who doesn't know basic math, such as two plus two, or how to tell time, his mother said. “Ethan will never be able to live a life on his own,” she said. He is gaining independence. Last summer, his parents began letting him ride his bicycle around their block near Georgetown Square. He enjoys watching traffic on Maplecrest Road, they said. Although Ethan Elzey looks like a typical child, Amy Elzey said he doesn't have the mindset, which sometimes causes behavior others misunderstand. He calls older people grandma and grandpa, offending them, his parents said. Ethan does love to talk, she said. He attends North Side because it offers the closest functional skills program, which focuses on work and life skills. His interaction with the general student body is minimal and usually at lunch, Amy Elzey said. This is his first year in high school, an environment that presented some concerns. Because Elzey is a follower, his parents worried about him following a random student to first period. His parents want him to experience high school activities, such as dances. He became a student-athlete through Champions Together, a partnership between the Indiana High School Athletic Association and Special Olympics Indiana. He played basketball along with participating in track. In February, Amy Elzey shared videos on social media from his last basketball game of the season. At home, he enjoys spending time with Nellie, an Australian labradoodle. The pooch offers companionship and comfort along with something to look forward to, his mother said. “He's my baby,” Ethan said. He has tough days, but his mother knows other families face more difficult situations. Shellee Goodman isn't a quitter. She graduated with a general diploma a semester early from Carroll High School, where she qualified for special education services, and has since tackled college. The transition to Ivy Tech Community College was challenging, but she made the dean's list. The 21-year-old didn't hesitate when asked what drives her. Shellee Goodman's condition that qualified her for special education services falls under the “specific learning disability” category, her mother said. The category encompasses reading, written expression, math, oral expression and listening comprehension disabilities. Math and spelling are particularly difficult. She was diagnosed with ataxia – a lack of muscle control or coordination of voluntary movements – in high school, her mother said. It affects her hands, making writing difficult. As a Northwest Allen County Schools student, Shellee Goodman had an Individualized Education Program. She could have extra time for tests, could have tests read to her if needed and could have a small group environment for testing and use a calculator, her mother said. “It was hard, but I got through it,” Shellee Goodman said of high school. Carroll's special education team deserves some of the credit, her mother said. “I felt like they were all on her side,” Julie Goodman said. Shellee Goodman, who is interested in working with giraffes in Africa, works at a pet care facility in northwest Fort Wayne and volunteers at Black Pine Animal Sanctuary in Albion. She gained experience at the Fort Wayne Children's Zoo through a senior internship and as an interpreter at seven exhibits the summer after her graduation. 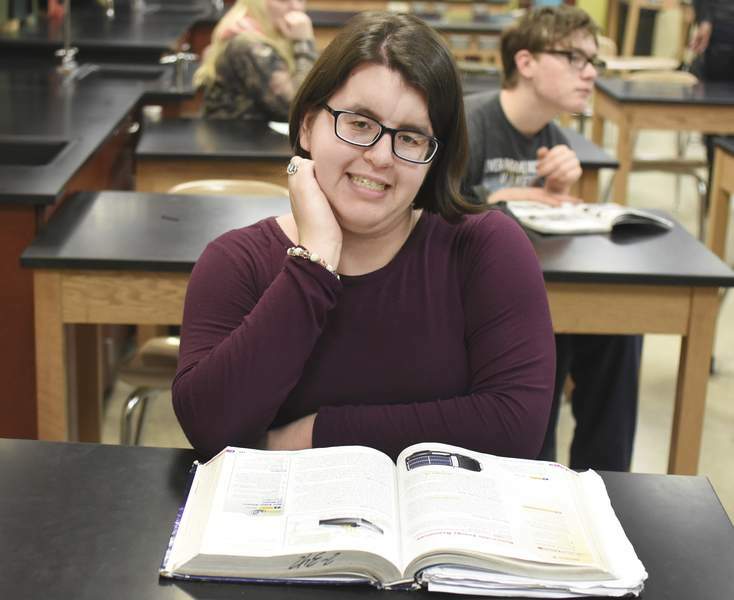 She is pursuing an associate degree at Ivy Tech, but her ultimate goal is to transfer to a university with an animal science or environmental science degree. “She wants to show people she can do it,” Julie Goodman said. When she was born, Devan Frayer wasn't expected to ever walk or talk. Feed her, change her, but don't expect too much. That's what her mother, Tina Frayer, recalls being told. The girl suffered from hydrocephalus, or excessive fluid accumulation in the brain. To drain the fluid, her mother said, a shunt was inserted in her brain with tubing running to her stomach. She was 2 days old. Her brain also didn't develop properly – it's “one big sphere” instead of two hemispheres – but she had the advantage of being young, when it's easier for brains to be retrained, Tina Frayer said. 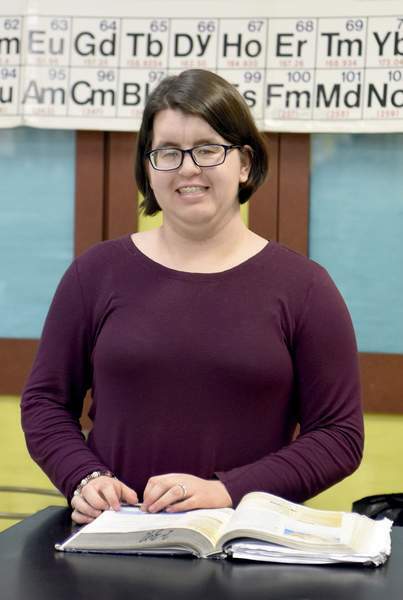 Devan Frayer, who has received various therapy services, is a happy-go-lucky North Side student set to graduate in 2020. She receives accommodations, including more time to get to classes, because of physical disabilities related to her medical condition. Her family worries about the shunt malfunctioning, which can trigger vomiting, high fever, blurred vision and a sudden onset headache, Tina Frayer said. Hitting her head is of particular concern, so she must avoid contact sports. To fulfill the high school physical education requirement, Devan Frayer took adaptive P.E. last school year but was determined to participate in a regular class this year. When her classmates play something she can't, like volleyball or basketball, she does something else, like laps in another area. “I've taught her very well how to advocate for herself,” Tina Frayer said. Jenna Mungovan is a Homestead High School student who can be detail-oriented and prefers to sort her Legos by size and color. She has specific preferences about other things – a tactile sensitivity guides her clothing choices – and, at age 20, she is ready to complete her high school career despite being allowed to attend until age 22. Mungovan, who will receive a certificate of completion, was born with underdeveloped wiring between her brain hemispheres and has a fifth-grade maturity level, said her mother, Lisa Mungovan. Diagnosed at 14 months, she received therapy services – speech, physical and occupational – from Lutheran Hospital's therapy staff through about age 6. She began walking and talking at age 3, her mother said. “That team stuck together with her,” she said. Her daughter benefits from consistency, Lisa Mungovan said. Constant turnover, which her daughter has experienced elsewhere, adds challenges. She continues to receive various therapies – recreational therapy at Camp Red Cedar, behavioral therapy from North Node Wellness and occupational therapy through Lutheran's outpatient therapy. She also visits the MindCAP Center in southwest Fort Wayne for cognitive skill development. In middle school, Mungovan began taking more functional classes – those focusing on life and social skills. She participates in the pre-employment transition services program offered at Homestead through a partnership with Easterseals Arc, her mother said. Her daughter has gained work experience at various places, including Walgreens, where tasks have included stocking and facing shelves. But Mungovan has limitations. Her seizure potential makes her unable to drive, and although she can read, she can struggle with comprehension.